OK, so I found a recipe that was supposed to be just exactly like those yummy (but not vegan) Pumpkin Scones that Starbucks sells... I used to be in love with those things. Well, the recipe wasn't all that great, so I messed it all around and made them much better (if I do say so myself) AND made them vegan. My family LOVES them. Then I posted them over at VeggieBoards and got a good reception there as well, so I thought I'd post them for you fine fellow-bloggers too. Yes, LOTS of ginger in these. But I'm a fan. And it's good for you! 2 cups pureed pumpkin (fresh or canned, either is fine). In a large mixing bowl, combine dry ingredients (flour, sugar, baking powder, baking soda and dry ginger and cinnamon). Cut in margarine and coconut oil, adding a bit at a time until mixed. Add pumpkin and candied and fresh ginger and combine well. On a lightly floured surface, knead dough a few times, pushing it into two corcles, a few inches thick. Bake at 425 degrees for 12-15 minutes, or until done. I usually sprinkle the tops with sugar before baking, or drizzle with an orange glaze or something if I'm feeling all Martha Stewart-y. Thanks for stopping by my blog! It lead me to yours! Those ginger pumpkin scones look so goooood!! I want to try it now! 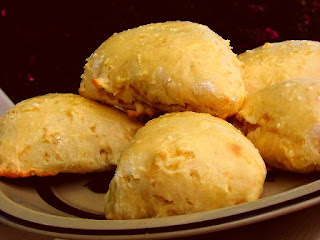 My mom loves scones-thanks so much for posting this!